Synoquin EFA Joint Supplement Capsules for Cats builds on the innovitive Chondroprotective feed supplement, now with added Dexahan for ailing joints and mobility problems in older cats, especially helpful in animals with arthritis. 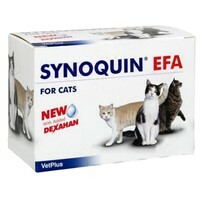 Synoquin EFA Joint Supplement Capsules for Cats is a uniquely patented combination of Pharmaceutical grade Chrondrotin and Glucosamine in the following amounts: Glucosamine (99% pure) 225mg, Chondrotin Sulphate (95% pure) 175mg, N Acetyl Glucosamine 99% pure 25mg, Ascobic acid (Vitamin C) 25mg, Zinc sulphate 15mg. Dosage: Give 1 capsule twice a day for a inital minimum period of 6 weeks. After the initial treatment period, depending on response, the number of capsules administered can be reduced to a maintenance level of one capsule once a day.